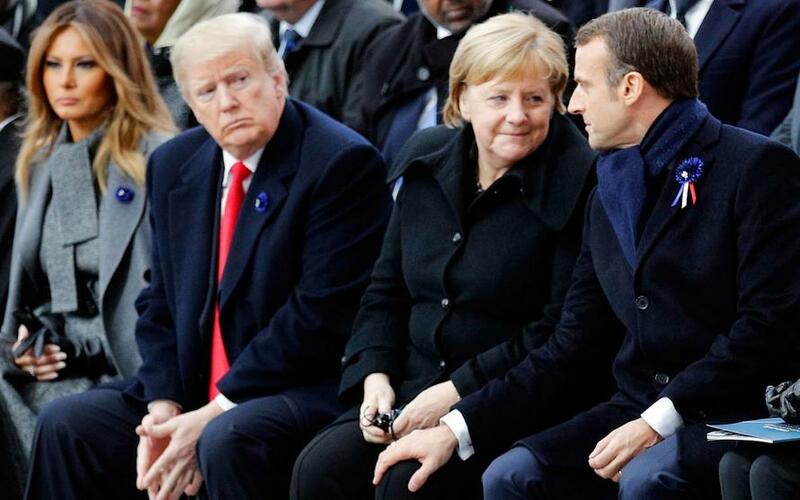 Two days after French president Emanuel Macron snubbed President Trump, slamming nationalism as the antithesis of patriotism during a closely watched speech with Trump sitting just a few feet away, and which prompted a flurry of provocative and taunting tweets by the US president demanding that Europe pay for its own defense (or else Paris would now be speaking German), Germany’s Angela Merkel set out her own vision of a more assertive European Union, one which aligned with that of Macron and included a European army. After spending the weekend commemorating the end of World War I in Paris alongside more than 60 global leaders and witnessed first hand the tensions between Trump and France’s Emmanuel Macron, the normally understated chancellor took an uncharacteristically bold stance as she addressed EU lawmakers in Strasbourg. In Paris, Merkel defended her world view against the U.S. president’s barbs as he sparred with Macron. And, as Bloomberg reports, she went a step further in the EU parliament on Tuesday, telling deputies they need to adapt to a world in which Europe’s traditional allies may no longer guarantee the continent’s security. While most europhile lawmakers applauded, the comments drew loud jeers from euroskeptic lawmakers at the margins of the chamber. Meanwhile, as reported earlier, on Tuesday Trump unleashed another torrent of tweets, grousing about the perceived slights from his weekend in Paris. At 6:50 a.m. in Washington, he tweeted another attack on the French leader, mocking the idea of a European army and implying that the French had needed the U.S. to rescue them from the Germans in both world wars. Trump wasn't done and over the next few hours, the president sent out a series of further jibes, accusing Macron of stirring up controversy to distract from his poor approval rating, complained about French tariffs on U.S. wine and offered an explanation for pulling out of a visit to a military cemetery due to bad weather. In response, a senior aide to the French president said he was glad that Trump had taken the time to study some history. Former Belgium Prime Minister Guy Verhofstadt gave Trump another history lesson on his own Twitter account. According to Bloomberg, the French official said he thought the tweets were aimed at Trump’s domestic audience, noting that the two leaders speak several times a week and their relationship is fluid, even if it isn’t always easy. The German leader has been urging her European colleagues to build new structures that will enable them to stand up for themselves since last year, when Trump castigated NATO leaders in Brussels and withdrew from the Paris climate accord. Not everyone is on board: the U.K. government, which is negotiating its exit from the EU, won’t support the idea of an EU army, a spokeswoman said.